Live Power Community Farm is a 40-acre, solar electric and horse-powered, diversified, Demeter Certified Biodynamic® farm, founded in 1973 by Stephen and Gloria Decater. Four acres are devoted to an intensive vegetable garden hosting some 60 varieties of vegetables and herbs. We use a glasshouse and cold frames to propagate vegetable and flower transplants, and grow home orchard fruits and field and forage crops for hay, grain, and pasture. Animal husbandry includes draft horses, dairy and beef cows, feeder pigs, sheep, and laying hens. We butcher and process meat animals, and bake bread in our outdoor, wood-fired brick oven. The farm is located at about 1,400 feet elevation in Round Valley in Mendocino County, California. The valley, with a local population of about 3,000, has the largest Native American reservation in California and is surrounded by the Eel River and the Mendocino National Forest. Local agriculture includes cattle and hay raising and small organic herb and fruit growing. It is hot and dry during the summer, with winter rains from November to March. We began operating as a Community Sustained Agriculture (CSA) farm in 1988, with 15 families who supported our goals of long-term productivity and soil and environmental health. Over the years we have consciously developed our farm by encouraging community involvement and interaction. We believe farms must not only provide healthy, nourishing food, but also create an avenue for people to re-enter the garden and develop the consciousness, strength, and commitment to care for it. Today, our farm is supported entirely by more than 200 families and individuals who carry the operating cost of the farm and share in the harvest, and by our school class visitation program for elementary and secondary school classes. Live Power Community Farm has been a certified Biodynamic farm since 1987. We are developing the farm to be an individualized, self-productive organism that generates its own power, fertilization, replacement plants and animals, and sustainably produces a surplus when properly cared for. We strive to become conscious of how every being and material feeds, supports, and serves another. We are founding members of the Biodynamic Association of Northern California, and meet quarterly with the group on different farms in the area. We make biodynamic preparations at the fall meeting, which is often hosted on our farm. Apprenticeship details: Since 1978, apprentices have been part of our farm community. Just as we once learned from the agricultural visionary Alan Chadwick, we now continue that tradition by teaching adults of all ages from the United States and abroad in work-study programs lasting from three months to three years. We operate the farm collaboratively with the apprentices. We rotate through areas of responsibility and learning throughout the season. The majority of the learning takes place through the hands-on work itself, and through the discussions that take place while working in the field. We hold a weekly organizational meeting including a garden walk and discussion. Longer, in-depth discussions often take place during meals, or in more formal workshops. We can generally fit in 6 or 7 formal workshops each season, usually during the spring and fall, on topics of the group’s choice. Evening study groups focusing on a specific text are also possible. 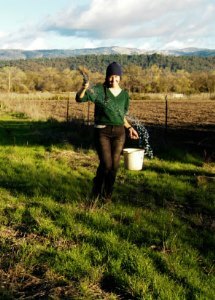 Apprentices may attend the quarterly meetings of the Biodynamic Association of Northern California, and are invited to seek out other educational opportunities outside of the farm, including workshops and visits to other farms. We want to work and live with healthy, non-smoking individuals with a positive, disciplined, attitude who are willing to participate fully in a hands-on experience of farm life. We prefer to work with apprentices who have at least one season of farming experience and who are committed to pursuing a career in agriculture. A two season commitment is required for apprentices who wish to go beyond the beginning draft horse skills and engage in the more extensive teamster training. We are also seeking experienced journeyman farmers to join us in longer-term partnership to share our lives and work, and to carry the farm forward into the future. We are currently exploring what that will look like in terms of business structure and farm infrastructure. This vision-crafting is an ongoing, organic process.